What is the future for the bookshop, and Waterstones in particular, on our high street? And what does this say about prospects for traditional retailers in Britain? Our analysis takes place following ‘Super Thursday’, which took place last week and saw 315 of the most in demand hardback books entering the market. Waterstones has encountered competition from online retailers, supermarkets and the inexorable rise of electronic alternatives. In 2012, the bookseller reached an agreement with Amazon to sell their Kindles, an ostensibly unlikely agreement as they had been seen as very much the antithesis to Waterstones’ traditional outlook. They did not however agree to sell Kindle e-books. Before the all-important Christmas campaign begins in earnest, using YouGov BrandIndex, we can analyse how Waterstones has been performing in recent months. 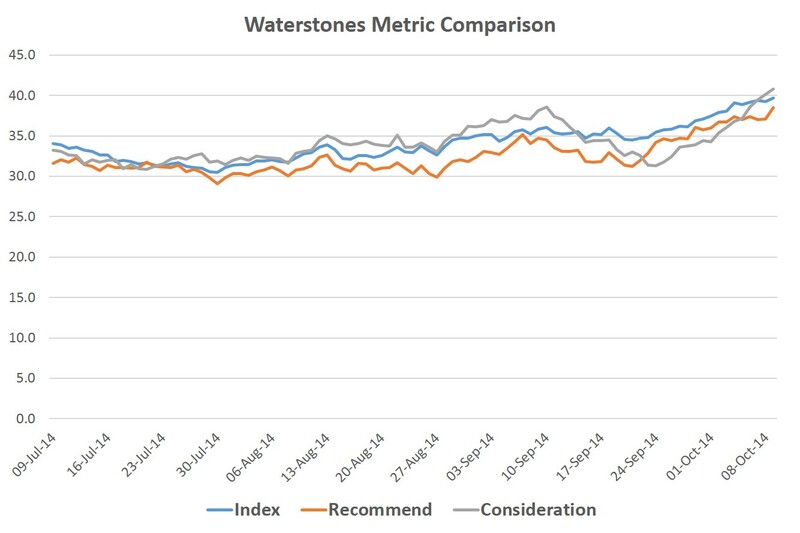 Across a range of metrics, we see great resilience and performance in Waterstones’ scores. Our Index metric takes in to account a range of factors, including ‘value’, ‘recommend’, ‘quality’ and satisfaction’. The average score for Waterstones over the last three months is a very strong 34.0. We can conclude from this that consumers are impressed with the overall service that Waterstones offers, believing it to be a quality and reputable organisation. We can analyse other metrics to gain a wider perspective of the areas in which Waterstones are succeeding. YouGov BrandIndex’s ‘Recommend’ metric assesses whether a person would recommend the company to a friend or family member. Again here, we see a very competent score of 32.4. So how does this actually translate into sales and customers through the door? Well, if we look at YouGov’s Consideration metric, we can ascertain if people are thinking about making a product from the retailer in question. Once again, we see a solid score of 34.0. With one in three thinking about buying a book or other product from Waterstones, it is understandable why the brand is remaining resilient in a tough climate for high street retailers. As more and more high street stores are threatened by online retailers it may be heart-warming for Waterstones to see their brand remain resolute. It is clear that consumers are not just melancholic for a traditional bookstore, but are actively impressed by the quality service they provide. Ahead of the crucial Christmas countdown, Waterstones will be hoping their reputation and place within the nation’s hearts will translate to a hugely successful sales period. How others on the high street will compare remains to be seen.